Optic Mounted Pistols and Concepts in Application. I ran my G19L with a Unity Tactical Atom slide, with an Aimpoint T1 2MOA , at an AMTAC Integrated Combatives class last weekend and a few old lessons became very obvious to me, and I wanted to share them. An AAR will be coming of an AMTAC Integrated Combatives class soon. During the first parts of the class we shot at close range, 7 yards and in for a variety of drills, this was not a pistol class, rather a combatives class which covers pistol application as a tool. Both days had similar weather which consisted of bright sunshine. I turned the T1 brightness to be compatible with the conditions and ended up around the 10 setting (10 out of 12) which worked for the first day's shooting. When we got to the end of the second day, we all ran the Stress Course, which included various stress-inducing tasks, the shooting portion consisted of several differently sized B-C Steel targets which had to be hit in order to move forward in the stress course. Starting distance was around 35 yards and it gained in distance to around 43-47 yards, second set of targets were between 20-30 yards, then there were several targets as you got closer. The above unedited image is of the T1 at 12/12 brightness setting inside a well lit room. You cannot see the target as there is washout from the brightness of the 2MOA dot. I had started off that day with a slightly lower setting 10/12 brightness and by the time it was my turn to shoot (last) the sun had moved enough to be shielded by trees, I did not change the brightness setting, was not thinking about it. The same image as above was my optic on the targets as I engaged them. One of the targets was a very small, reduced B-C Steel and the brightness of the RDS completely covered it, not allowing me to get a precision shot. However, I knew that based on my estimation of the distance that my 25 yard zero (top of dot) would produce effective shots up to 50 yards with about an inch or so margin of error, which is good because B-C Steel is not that small, even the reduced sized B-C Steel is not small enough that I would miss continuously. I was able to effectively run through the targets until I got up close, at around 7 yards when I began to employ backplate shooting as I could not see the target at all due to the brightness intensity of the RDS. Well why didn't you just adjust it? Good question, and I was not thinking about it at that time due to the other variables of the stress course which I had gone through. Sometimes you do not do things you should, especially if you do not train to do them. With my RMR-mounted Glock's this is not even an issue as I keep them on "automatic" mode which automatically adjusts brightness due to lighting conditions. With bigger dots this has been an issue (like 6.5 MOA) but with the RM09 1MOA RMR I have, this is a non-issue. Also, after getting past the longer ranged targets fairly quickly I knew that once I got up to the 20-30 yard target range that the impacts would be POA/POI, or a close variation of under half an inch or so. I know this because I zero my RDS, the T1 or RMR at 25 yards. There is a lot of contention on this topic, my take on it is fairly simple. I have a pistol with an optic mounted onto it because I want to be precise at distance, not because I want to be precise up close. I can use iron sights and be precise up close. Using Ameriglo Defoor sights for example I can be as accurate as the standard suppressor height sights which came with on the Unity Atom slide which measure to be .115, same as the Defoor sights. With a good bit of dry fire most people can be just as accurate up to 25 yards. 25 yards and out I want to be as accurate as humanly possible, this is a far enough stand-off distance that most will question the implementation of a pistol, especially in the courtroom. However, with an RDS optic mounted on a pistol you could probably make an affirmative legal argument for using it in combination with modern defensive ammunition, since that will yield a more consistent result. With a 25 yard zero on your optic, you could hold center of dot on a target from 15 yards to 30 yards and there will be less than half an inch variation in point of aim to point of impact. For precision shooting this is exactly what is needed to make a very difficult distance shot, especially when your adrenaline is pumping if you found yourself in that particular situation. At 15 yards and in, you should be able to use your iron sights, especially if they thin, to put effective rounds on target. Ultimately this turns into another argument against optics on pistols as the average deadly force confrontation distance is less than 7 yards. The fact is also that the first two or three shots are done not with the front sights in focus but with the bad guy in focus, only after the initial contact will the rate of fire slow down as the front sights are being picked up (we are talking under a second here for all these shots). There is also the fact that the vast majority of pistol shooters started shooting pistols without optics. This means they have a lot of reps burned of shooting and dry-firing pistols with irons sights. I have tens of thousands of reps with iron sights on pistols. Dat seraph doe #Repost @vdevelopmentgroup ・・・ Do you have a #Glock with an optic on it? 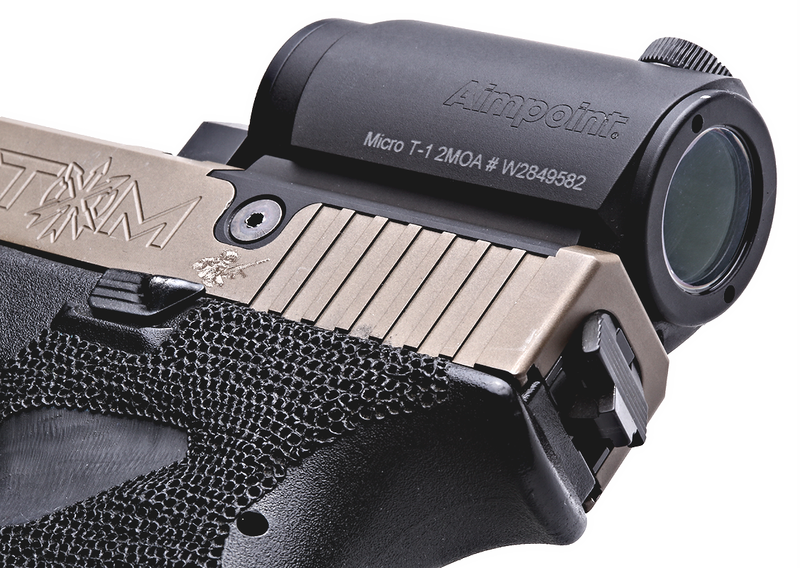 Like the #RMR or a @unitytactical #atom slide with a @aimpointusa #t1 or #t2? Are you looking to carry it #aiwb comfortably while still maintaining all the attributes and characteristics which are required​ for effective implementation of that pistol. Do not settle for holsters that are not designed properly​ around the #concealcarry of an pistol with an optic. Most simply do not understand there many issues present and simply do not cover them properly. When combined with our #neoprene #wedge you will see a very efficient setup for #appendix #carry. The #Seraph is a premium holster. The difference here, as I have mentioned repeatedly when this topic is brought up, like the first time I ran an RMR'd Glock and my review of the Dueck Defense RBU, is that I, like the vast majority of people, have too much time invested in iron sights and therefore are measurably faster with them, especially so at close distance. To become as fast with an optic on a pistol as with iron sights a person would have to devote a significant amount of time to dry fire and overall training with that optic. This is because we have trained to pick up the front sight as we draw and put the gun on target, focusing on the front sight. 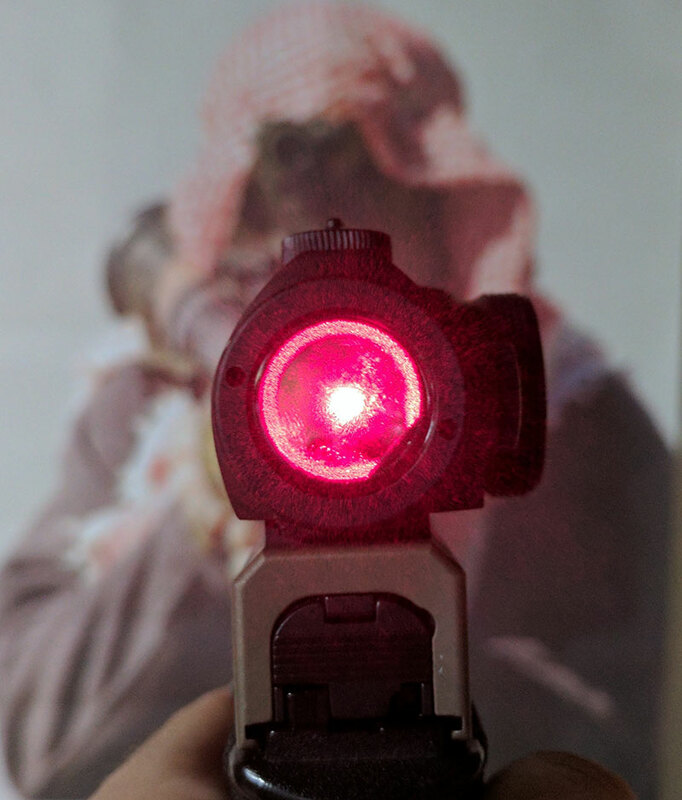 With an optic we have to train to focus on the target and then overlay the dot on the target, not having the dot in focus, but rather the target. This is going to be difficult for most people to do and a lot slower for a long time as people do the reps.
Is it worth it? For me, it is most definitely not worth it. I carry a non-optic gun at work, I conceal carry a non-optic gun outside of work (most of the time) and I train with a non-optic gun, because I do not normally carry an optic gun enough to merit giving it a chunk of my training time. I do not invest my time into optic mounted pistols because there are too many limitations, those which have real life consequences. So what is the role of an optic on a pistol? For most people it is fun to shoot, because you can be extremely more accurate with more predictability (ie: precision) with an optic mounted pistol. I use them to test various add-on's like the Overwatch Precision trigger and the reduced pre-travel SCD. I also use it as a diagnostic tool. If I go to the range and shoot a crappy 100 drill two times in a row, I have to know if it is the gun or me. Having a properly zeroed optic mounted pistol is excellent for this purpose. You will know right away if it is you or if it is the gun. The current acceptance of optic mounted pistols for concealed carry is, in my opinion, due to two factors. The popularity of them for competition shooting and older guys having trouble seeing the front sight clearly, of course photos of optic mounted pistols help sell them too. For concealed carry a person should probably carry a light/laser combo attached to an optic mounted pistol. In low/no light an optic may not work properly (auto setting) or it may wash the target out completely if no white light is added. A laser zeroed at a short distance (like 5 yards) would allow for an effective combination for anyone to use an optic mounted pistol properly. However, the average person will not carry this way, I do not carry a light on my pistol, but then again I do not carry an optic on my pistol either everyday. Not seeing the dot, or having the dot be too bright are both real issues. Having the dot turn off due to being bumped is a real issue. Batteries dying and a pistol not having iron sights equipped is a real issue (believe it or not, there are people who have pistols setup like this, dot only). Environmental conditions may hinder the application of the optic, like rain or snow falling into an RMR for example. Ever shoot a wet T1? Not good. It has been fairly apparent to me that optics on pistols have gained popularity because they look pretty cool, they also help a below average shooter be middle of the road average in terms of precision, which is good of course but the detractors above do create a circumstance which may cause an issue. None of which exist with standard iron sights. Furthermore, almost all conceal carry holsters do not protect the optic from contact. An LED RMR, like the two I have, can be bumped hard during a physical altercation, broken or settings mashed which may present with an unusable optic, then you are back to square one using suppressor height iron sights if you have to take an accurate shot. We know this can happen because people who have taken FoF classes with RMR mounted pistols have experienced this. To contrast with a pistol with good iron sights, in a good conceal carry holster which was created around protecting both front and rear iron sights, it is very difficult to argue against this in terms of general practical application for the average CCW citizen. I am not particularly making a case against owning optic mounted pistols, as much as I am making a case for training with the tools you will most likely use and succeed with in a violent, especially deadly force confrontation. If you spend a lot of time doing reps with an optic mounted pistol, and you do not carry one, then what you are doing is practicing a skillset which will not actually help you overcome a deadly force threat, especially when you could be getting better or more accurate with the pistol you actually carry. Understanding your particular application, and how to train to win your statistically probable confrontation is the best course of action. For the vast majority of CCW citizens, that confrontation is not won with an optic mounted pistol, and especially not at distance which would require an optic mounted pistol over a pistol with iron sights, especially when held against legal reasonableness. Where do optic mounted pistols work best and fit the most? 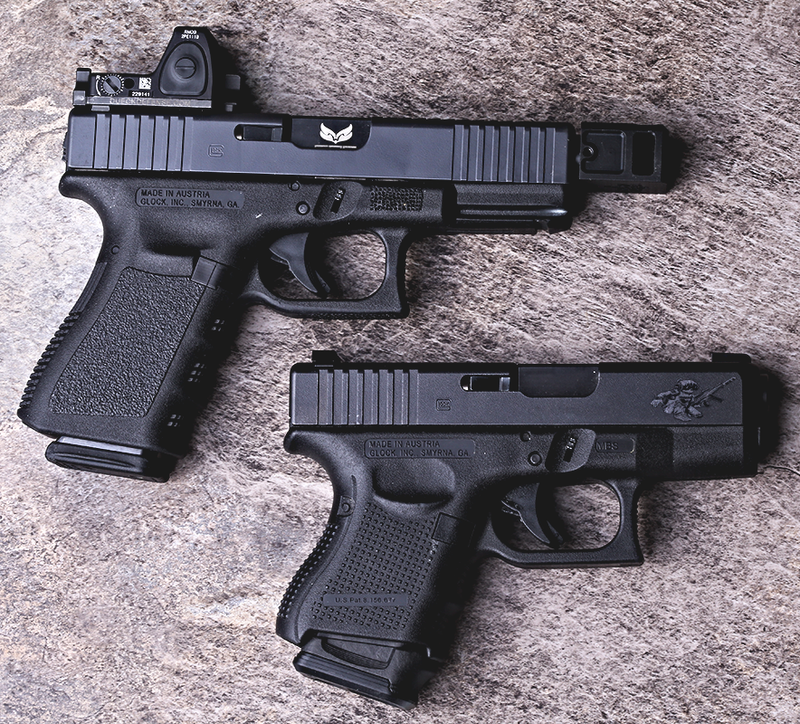 You may have heard of the Roland Special which, as legend/myth goes, was conceived of for the purpose of LE application, like hostage rescue or a situation where a special operations team comes in with RMR covered holsters meant to do a very specific task in a very specific situation. I would also say that for home defense it may be a good combination especially for people who are not comfortable shooting pistols or using standard iron sights. 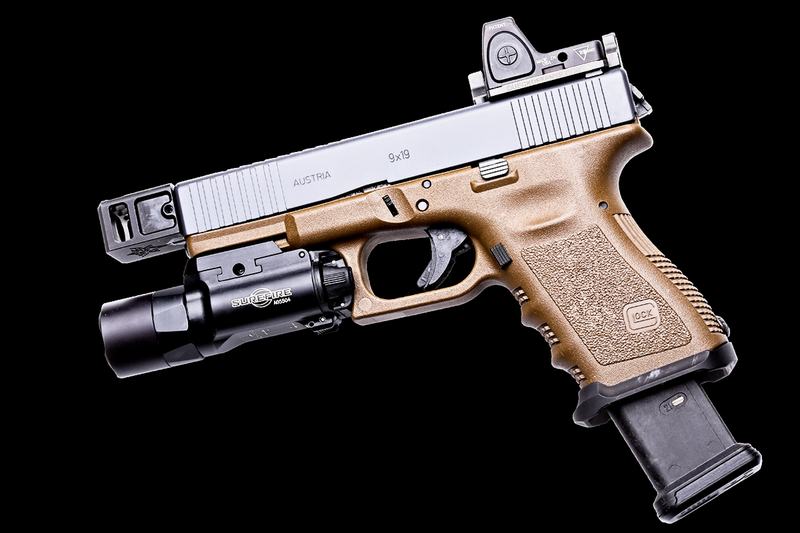 A gun sitting in a drawer with a light/laser combo, 21 or 22 rounds with an optic on it, comp or not, can or not, is a pretty decent home defense tool, though that is a totally different article. So as usual, training trumps equipment, and the fact the vast majority of people already have a lot of time on pistols with iron sights, as well as the fact of statistically probable distance of deadly force, should paint you a clear picture of what you need to spend time on most. Train with the tools you fight with, not the tools you think you will, in methods you might. Train to win the fight. FBI LEOKA Sourced Statistics Referenced.